Newry, Mourne and Down District Council Chairman, Councillor Mark Murnin welcomed 23 French students to the Council Chamber in Newry. 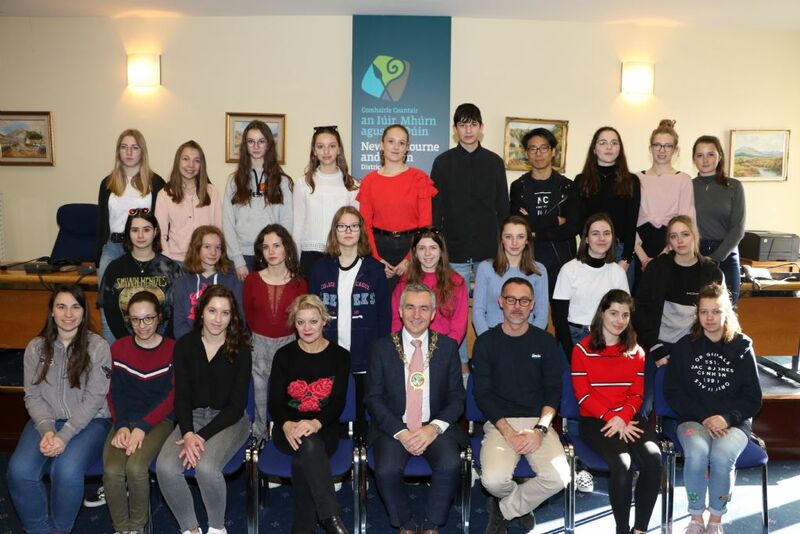 The students from Lycée Jean VIII from Reims, in the Champagne region of France, were visiting Sacred Heart Grammar School in Newry on an educational exchange. Speaking at the event, Councillor Murnin said, “I want to extend my thanks to our local teachers, especially those from the Sacred Heart Grammar School, for taking the opportunity to develop links with schools in Europe. Our Council area has many assets including a beautiful natural environment, a strategic location on the island of Ireland and an impressive built heritage. I am delighted that we can share our district with students from further afield via exchange programmes. I hope you will have the opportunity to tour the area to see first-hand what we have to offer. The students were accompanied on their visit by their teachers Stéphaine Trahard and Raphaelle Monniot, alongside Simon Burke from Sacred Heart Grammar School. Students from Sacred Heart had the opportunity to visit their French counterparts in January 2019, and the schools hope to continue the exchange programme for years to come.